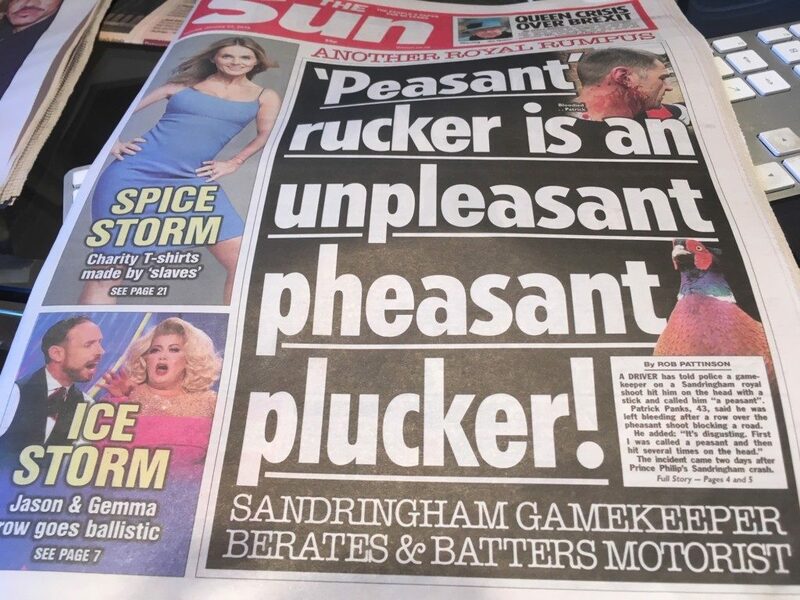 The Sun leads with Patrick Panks, 43, who claims he was hit in the head and called a “peasant” by a gamekeeper on the Royal Family’s Sandringham estate. Mr Panks say a shoot was blocking the road. He complained (‘I say my good man, I’m in terrible dash. Will you be long?’, or words to the that effect). Mr Panks says the gamekeeper then hit him “several times”, causing lacerations to his head. Nasty stuff. But it’s only front-page news because Sandringham is newsworthy. We’re told the alleged incident occurred two days after Prince Philip’s prang, aka the “horror smash“. So there are two more pages of the plebs verses the ruling class. The Royal Family aren’t all commemorative china cups, thimbles and faces on stamps. They’re a clique of guns, dead animals, lots of land, mastery of the handshake and more guns. It’s only in death that we get too glimpse the real them, and then only after the official biographies have doused the corpse’s remains in a gossamer weave of heroic deeds, terrific fashion nouse and hearts bursting with a purity of spirt that reaches the divine. So was it feckless Andy wielding the stick? Unlikely. The effort involved alone would rule him out. What about Phil? The Suns says he was “once the Royal Family’s keenest shot. But he is now only an observer during shoots.” He might not spot a nippy hatchback – but never misses a game bird.